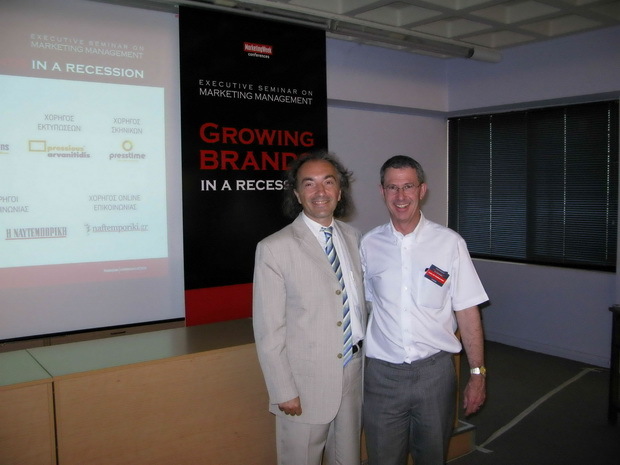 In July 08, 2009 in Athens, Greece Boussias Communications organized an Executive Seminar on Marketing Management on “Growing brands in a recession” topic. Keynote speaker was the renowned Professor Leslie de Chernatony (Professor of Brand Marketing at Università della Svizzera italiana & Aston Business School), one of the leading experts in brand research, where he discussed a paradigm shift. This executive seminar took the perspective that the recession represents an opportunity to reconsider how brands can offer more relevant and welcome value. It is not a case of "business as usual" with a reduced budget, rather how can that budget be better used to deliver a "wow" through more appropriate value. The strictly customized content of the executive seminar on Growing brands in a recession, aimed at providing practical advice and a how-to toolbox for middle-upper marketing executives, concerning ways for maximizing brand equity during a recession. Mr. Christos D. Katsanos, Executive Director of the DKG Group after the completion of the seminar said: “Professor Leslie de Chernatony has the ability to create enthusiasm, involvement and understanding among the people attending his workshop. I would without doubt recommend Leslie as a sparring partner working with brand management issues”.